Unbox: Newbie’s Adventure is an open-world 3D platformer where you bounce and roll your way around as a box. You start at an off-shore oil rig that serves as your hub, and you learn in the opening cutscene that the postal service has problems losing its packages en route, but they’ve developed a solution: self-delivering packages. After you complete a short tutorial of how to move, jump, and unbox, you’ll then roll into a bigger box filled with those packing peanuts and ship off to Paradise Isles, where you must complete a few minor challenges before you may explore freely. Humor is abundant in the dialogues when the boxes tell jokes that make sense for a box, as when Zippie #52 said it liked the sound of tape, or by acknowledging other games, as when you’re asked if you’ve ever played Cardboard Duty. Likewise, the story itself is humorous: a distraught group of boxes, who call themselves the Wild Cards, are threatening GPS (Global Postal Service), the company for which you work. Why did these Wild Cards splinter from GPS? They were tired of being treated as objects. You’re free to roll around and explore, or you may attempt challenges in exchange for a stamp. 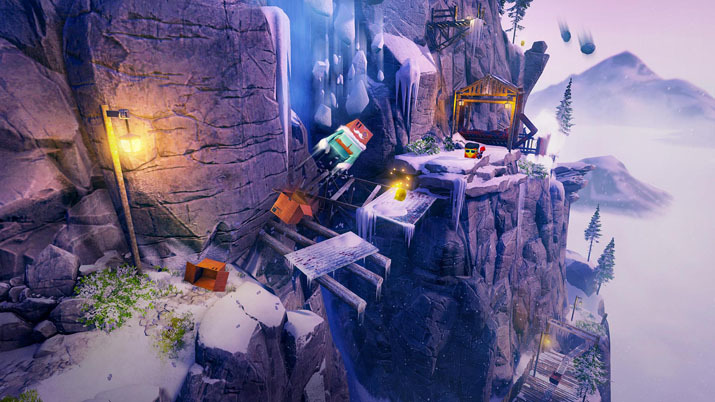 Challenges are often timed and involve completing laps around a set course or acquiring lost objects for your fellow boxes that the Wild Cards stole. Collecting ten stamps grants you the option to take on the boss, and once I collected ten, I headed to confront the boss on Paradise Isles; this is the only linearity to this title. Subsequent levels require more and more stamps before you can face the boss. I felt a sharp spike in suspense and tension at the prospect of taking on a boss, and I won’t go into many details, but I will tell you this -- it’s fun, chaotic, mayhem, and a complete blast! If you defeat the boss, you’ll obtain the master stamp for the world, then Bounce (a fellow box) will allow you to access the next world (Parcel Peaks, in this case). There are four worlds, if you include the hub. While this may not seem like much, there’s plenty to explore within each world. You get a notification when there is a hidden zippie that’s locked inside a cage or stamp nearby. This dampens the fun in exploring every inch of your world, but does prove handy [EN: It’s either this or those damned white-tailed lizards from SotC]. Unboxing depletes one health point, but sends you skyward, making high ledges a breeze to access. You have a maximum of six health points, and you must either find a health box to replenish one point or visit a GPS mailbox checkpoint to refill your health to the max. 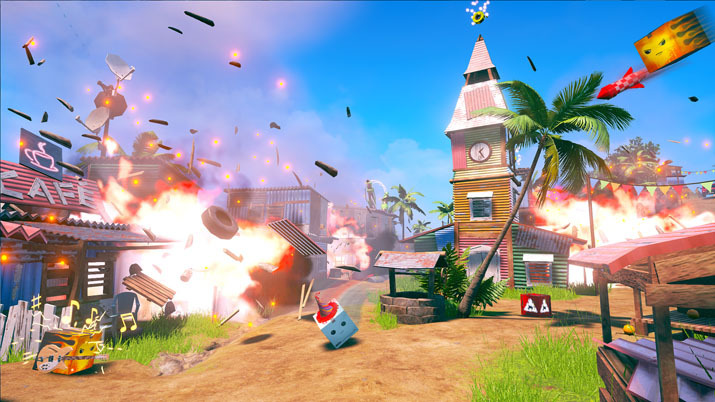 Enemies, explosive boxes (such as TNT) and fire may also damage you. If something damages you to the point you would drop below zero, you respawn at the last mailbox you visited. You can also manually respawn at your last checkpoint, instantly refilling your health. I’ve used this feature to quickly return to my last checkpoint and re-attempt accessing a barely reachable ledge that I missed. Perhaps the most difficult aspect of Unbox is the platforming elements when you’re trying to reach areas, or the timed challenges. Although, you’re often given more than enough time to complete the task; I tended to barely finish a race or fail [EN: This]. Overall, this isn’t particularly too difficult, and you don’t have to fear the dreaded Game Over screen if you deplete your health. But, the enjoyability and size of the maps, with all they offer, easily offsets the slight lack in difficulty. Unbox is meant to be fun and wacky, not frustrating. Obtaining specific stamps unlocks a cosmetic item in the Swift Tailoring house. There are other ways of unlocking cosmetic accessories and box skins, such as collecting all the Golden Tape in a level, or beating a boss. You may find these houses as you explore a level, but an easier option is to customize your box from the start menu after you load your profile. I’ll admit, I never grow tired of this Taylor Swift name gag (Shop Heroes makes a similar reference--the tailor there is named Swyft). It’s just better if your tailor is swift. Loading times seem a tad long, but this is unlikely to pose a problem unless you’re frequently switching worlds. I also notice that when a cutscene begins at the start of a world, the window switches from fullscreen to windowed. It’s an easy fix, but if you run more than one monitor (I just send the video output to a television screen), this can be more of a hassle. The maximize window button on the application doesn’t maximize the window, but just makes the game’s window active if you aren’t careful and precise with your mouse click. But, this isn’t always a safeguard. The alt-enter technique sends the application back to your main monitor. There’s also an issue with the achievements. After I had found a secret diary entry in a world, I obtained the achievement Heroic Saviour, which requires you to find and rescue every zippie in every world. But, I hadn’t even visited every world yet. Also, I did not obtain the achievement for customizing my box after giving it a cosmetic makeover. On the last level, there is a puzzle to complete for a stamp, but your box stops moving entirely once you do complete this. Another, yet minor, issue is that there’s a disconnect between your progress in a world that the hub reports and your actual progress in that world. If you have friends over, there’s a competitive local multiplayer, where each player vies for first place. Within this, there are five game modes to try, each with a different goal, and about a dozen maps to explore. Unfortunately, you cannot set up AI to play against, so multiplayer is only functional if you have other people with whom to play. You could play multiplayer solo, but this defeats the purpose.